Poland’s S4GA manufactures solar airfield ground lighting (S-AGL) systems, which can be used as a permanent alternative to standard, underground wired AGL systems, ideal for airports without an electrical grid or with unreliable electrical infrastructure. 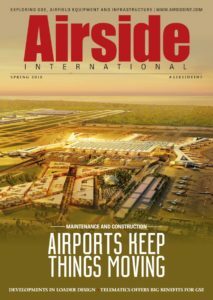 Airside talked to business development manager Dmytro Kuczeruk about this rapidly developing niche of the AGL market. S4GA was formed as recently as 2011. It was set up with the aim of offering a serious alternative to conventional wired/cabled AGL systems, and it quickly grew into the company that it is today – a designer, manufacturer and seller of off-grid solar-powered and hybrid airfield lighting systems. S4GA was established as a private enterprise and started supplying its product to the Polish armed forces, police and air ambulance service. At this stage, the Polish Government offered to co-invest, subsequently becoming S4GA’s biggest shareholder. The decision to invest in airport infrastructure, a new departure for Poland, was aimed at increasing the nation’s attractiveness for investment. While Poland has a strong aircraft manufacturing background, it doesn’t really have a history in airport infrastructure design and manufacture, so S4GA is very much a pioneer in that way, says Kuczeruk. It is also unique in what it offers the airport market. Its solar-charging airfield and helipad lights are ideal for regions where there is no electrical grid or where the grid is unreliable: in Africa, the jungles of Brazil, the Maldives, and so on. S4GA’s lights require no mains electrical feed, each individual light’s power instead being sourced from its own battery charged from its solar panel. Other manufacturers offer solar-charged lights but they tend to be temporary, mobile lights, Kuczeruk informs, while S4GA’s are designed for permanent fixed installation as a primary alternative to wired AGL at sites such as regional airports or helipads. Solar-charged lights are easy to maintain, and require no cabling or electric generator/power station. They are also very economical over their lifetime, employing as they do the entirely natural power of the sun’s rays. They are very easy to install too. Unlike a conventional wired/cabled AGL system, an S4GA system can be installed by a few capable technicians in just a few days, Kuczeruk asserts. That is not to say that S4GA’s AGL systems are not high-tech, however. Each light’s performance can be individually monitored and controlled – they can be independently switched on and off via wireless radio controller. Up to now, about 40 S4GA installations have been made around the world, at airfields, military helipads, air ambulance sites and so on. Among other recent projects, S4GA lights have been introduced by Fraport at Thessaloniki Airport in Greece (Germany-headquartered Fraport operates 14 airports across Greece), are being installed at Dhaalu Airport in the Maldives, have been chosen by the South African police for its remote helipads, and installed at a military airbase in Libya. For more information on the latter, see the accompanying panel. S4GA is building on its unique AGL option, Kuczeruk says: for example, it is developing the world’s first solar-powered High Intensity Runway Lighting that would be suitable to equip precision approach CAT 1 airports that are required to operate in all weathers and in all conditions. Until now, solar-charged lights have had sufficient light output for such airports, Kuczeruk notes, but that is now changing. S4GA has called its new prototype light the SP-401 CAT I and the company is looking to the traditional, conventional hub airport AGL market with a solar offering, he remarks. Also on offer is a hybrid alternative. This light’s battery can be charged from the light’s solar panel or, alternatively, can receive its power from an existing 6.6 amp electric grid. This gives those airport operators who aren’t 100% confident in solar technology faith that a back-up power source is available. Kuczeruk is sure that such users will come to trust the solar design, however, and eventually see little need for the electrical power back-up.